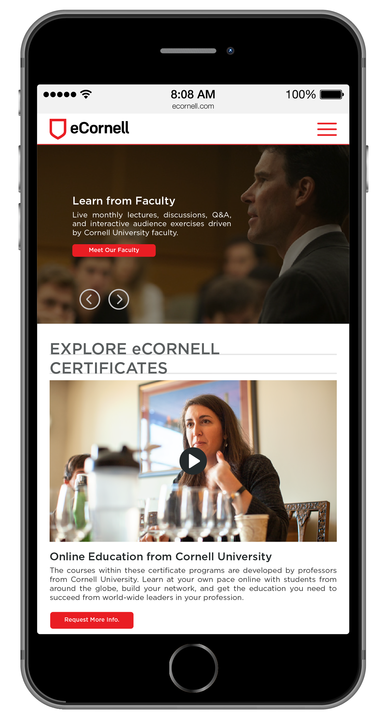 eCornell provides online professional and executive development to students around the world by combining the most effective elements of an Ivy League classroom with the flexibility of an online learning environment. Our team worked closely with eCornell to understand the desired outcomes from the new website; optimizing the search functionality of programs, making education surrounding eCornell and its offerings more engaging, and streamlining the navigation of the site to increase customer acquisition while also enhancing the aesthetic design of the site to heighten the user experience. Bluefin worked with project stakeholders to define the eCornell site requirements and build an intelligent site architecture that put the user experience at the forefront. Our team created a new site search structure to enhance the functionality for visitors to discover eCornell programs and offerings that they were more likely to purchase as well as built a “Compare Programs” functionality so visitors could go a step further in identifying the best program for them. Our design team worked closely with project stakeholders at eCornell to design and develop key elements of the digital web experience that were driven by requirements defined in our ideation and market testing phases. Our team built the site to function in web, tablet, and mobile environments to ensure that the eCornell story was presented to each visitor in a purposeful way. Based on the technical requirements, Bluefin worked collaboratively with eCornell’s development team to deliver the design vision and create the new eCornell website.